The active spirit of independance in Impressionism --- if not its style --- may be considered to date from this famous work, refused by the Salon in 1863 and exhibited, under the title of Le Bain at the Salon des Refusés of the same year. It is the larger of Manet's two versions of the subject, a smaller and freer version being in the Courtauld Institute Gallery in London. 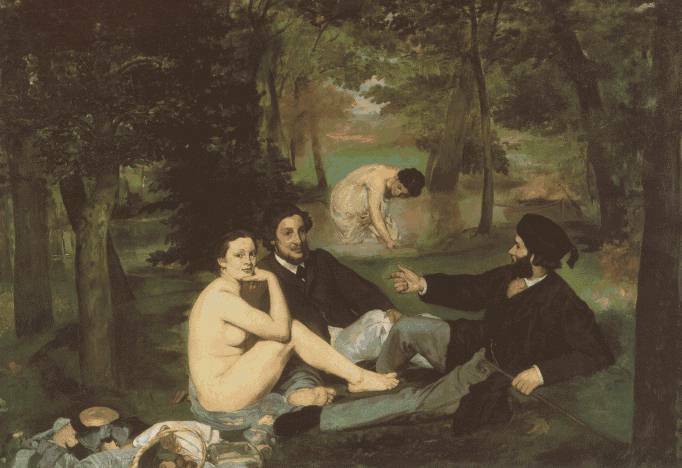 According to Antonin Proust, the idea of the picture suggested itself to Manet when they were watching bathers at Argenteuil. Manet was reminded of Giorgione's Concert Champêtre and determined to repeat the theme in clearer colour and with modern personnel. A closer likeness of composition has been found in an engraving by Marcantonio of a group of river gods, after a now lost original by Raphael of The Judgement of Paris . An Old Master element of formal arrangement remains to distinguish it from an essentially Impressionist work and yet as well as being ostensibly set in the open there are various hints and suggestions in light and colour of fresh possibilities in open-air painting. The furious outcry it caused as the principal exhibit among the Salon rejects was based on the alleged indecency of two fully-dressed men appearing in the company of the naked female bather (an accusation no one had thought to make against the comparable juxtaposition in the work attributed to Giorgione). But the respectable persons represented in sedate conversation were Manet's favourite model, Victorine Meurend (whom he also painted as a toreador), his brother-in-law, Ferdinand Leenhoff, and Manet's younger brother, Eugène. Public hostility not only helped to make Manet a hero in the eyes of the young painters but brought together in his support the group from which the Impressionists emerged. How far Claude Monet was impressed by the picture may be gauged from the fact that in 1865 he decided to paint his own Déjeuner sur l'Herbe , though simply as a group of picnickers without the element of dress and undress and in more natural attitudes than the figures in Manet's composition. Only a fragment of this large work has survived but a Déjeuner sur l'Herbe by Monet in the Hermitage, Leningrad, is apparently a replica---not so grand a work as Manet's but with more veracity of informal, sun-lit grouping. Manet himself changed the title of his painting to Le Déjeuner sur l'Herbe at his exhibition of challenge and protest in 1867. It came to the Louvre as part of the Moreau-Nelaton Collection in 1906.